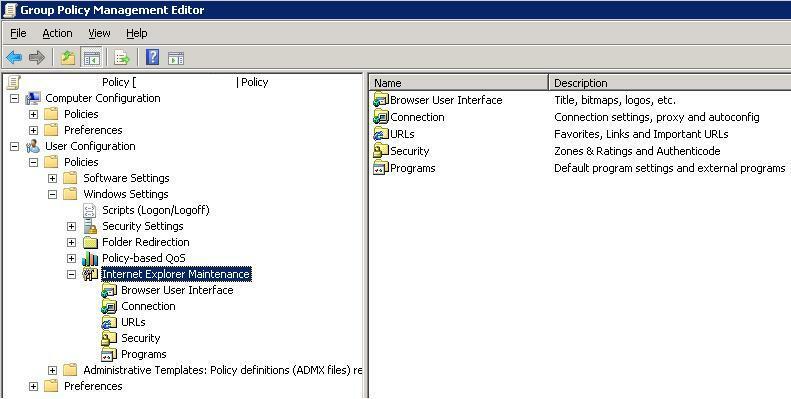 Originally, to configure Internet Explorer settings from central location (most often you need to specify proxy server configuration) using Group Policies in the Active Directory domain environment, the Internet Explorer Maintenance (IEM) policy was used, which was located in the user GPO section: User configuration –> Policies –> Windows Settings –> Internet Explorer Maintenance. But since Windows Server 2012 / Windows 8, the IEM policy has been deprecated. The developers of Microsoft decided to change the approach to setting IE parameters using the GPO and completely removed the Internet Explorer Maintenance section from the Group Policy Editor console. The familiar Internet Explorer Maintenance section of the GPO also disappeared in Windows 7 / Windows Server 2008 R2 after you install Internet Explorer 10 or IE 11. And even if an old policy with IEM is linked to the computer with IE 11 / 10, in fact it does not apply. Note. Since January 2016, Microsoft has stopped supporting all older versions of Internet Explorer (IE 6, 7, 8, 9, 10) for security reasons. Microsoft also stopped to release updates and security patches for outdated versions of IE. This means that at the current moment, only IE 11 is supported browser version, and the old versions of IE in any case should be updated to 11. Attempts to find the new location of the section with IE settings in the GPO editor on Windows Server 2012 R2 using the GPO search won’t give anything. How does Microsoft engineers suggest further customize the browser settings (including the proxy server) for Internet Explorer? As it turned out, now it is possible to do it using GPP (Group Policy Preferences) or with the special extension Internet Explorer Administration Kit 11 (IEAK 11). Tip. Group Policy Preferences appeared since Windows Server 2008. To make them work on XP (Windows XP support has ended) and Windows Server 2003, you need to install a special extension — Group Policy Preferences Client Side Extensions. So, in the GPO Editor console (Group Policy Management Console – GPMC.msc) go to the section User Configuration -> Preferences -> Control Panel Settings -> Internet Settings. In the context menu, click New -> and select the IE version that you want to configure. Tip. 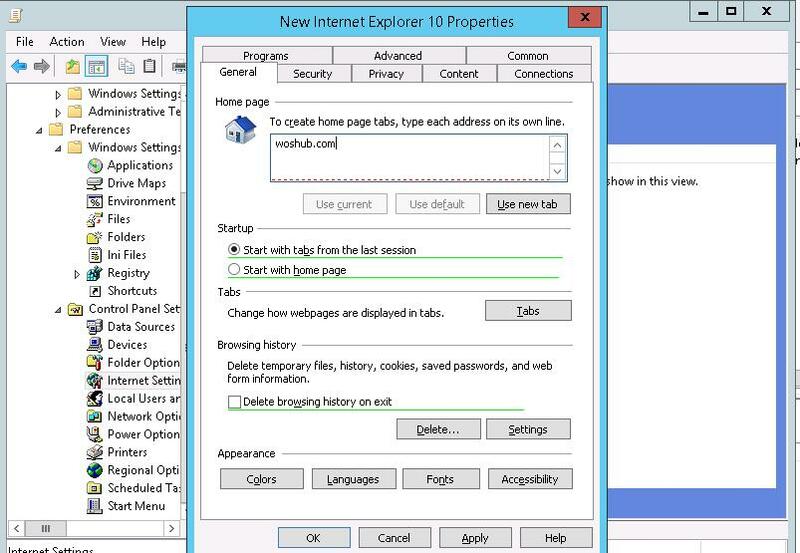 Although there is no separate option for Internet Explorer 11, the Internet Explorer 10 policy should apply to all versions of IE above 10 (in the InternetSettings.xml policy file, you can see that the option is valid to all IE versions from 10.0.0.0 to 99.0.0.0). Create a new policy for IE 10 (and later). As you can see, the IE settings configuration has become more convenient. 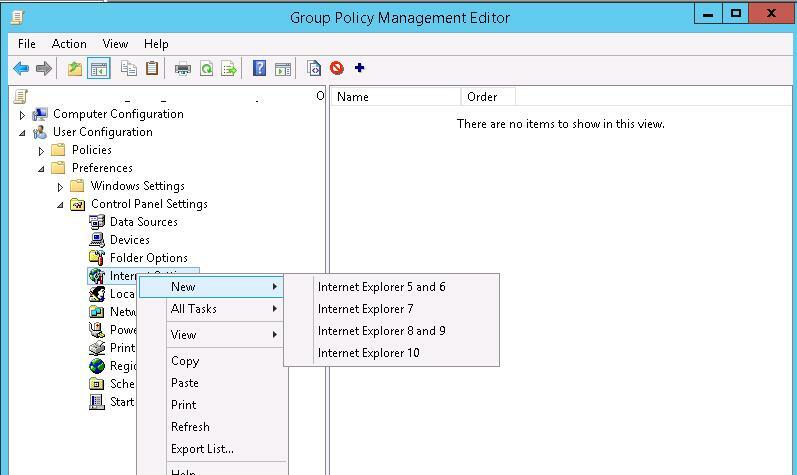 The IE settings in the Group Policy Preferences repeat the settings tabs for any compatible IE version. Specify the home page (General -> Home page). Important. It is not enough to simply save the changes in the Group Policy Editor. Notice the red and green underlines of the IE settings. Red underlining indicates that this setting will not apply. To save and apply a specific setting, press F5. A green underline of a parameter means that this IE parameter must be applied via GPP. Proxy Server (the proxy server address is directly set in the policy setting. This is the easiest way and we will use it). Check Use a proxy server for your LAN, and specify the IP/ FQDN name of the proxy server and the connection port in the corresponding Address and Port fields. 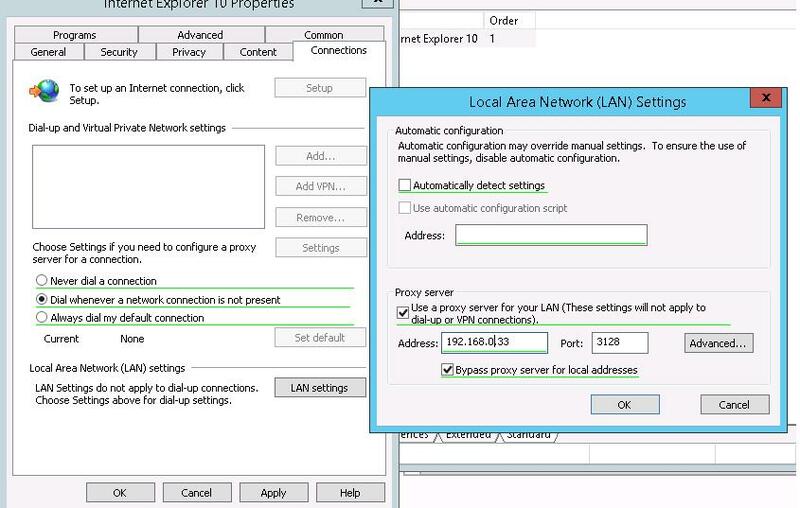 By enabling the Bypass proxy server for local addresses option, you can prevent applications (including the browser) from using a proxy server when accessing local resources (in the format http://localnetwork). In the event that addresses of the form http://web1.woshub.loc or http://192.168.1.5 are used, then these addresses are not recognized by the system as local ones. Press Advanced button and add this addresses to the field Do not use proxy servers for addresses beginning with in the following format: 10.1.*;192.168.*;*.woshub.loc;*.local.net. Tip. Proxy settings in Google Chrome can be set from central location through the GPO using special administrative templates. For Mozilla Firefox, you can use this solution. It remains to link the IE policy to the AD container with the users and update the policies on them. After applying policies on the users’ computers, new IE settings should be used. 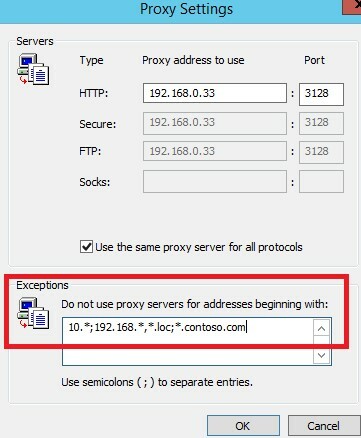 To prevent users from changing the proxy server settings, you can use this method. If you are using Windows 2008 R2 / Windows 7 to manage IE policies, the new Internet Settings policies for IE 10+ are not displayed on them. To fix the problem, you need to install the latest version of RSAT or the latest version of administrative templates for IE (Administrative Templates for Internet Explorer). So, let’s summarize: the IE settings, starting from IE10, are no longer configured in the Internet Explorer Maintenance section of Group Policies. You have to use Internet Settings with a new interface in the Group Policy Preferences instead. For each version of the IE you will have to make their individual settings GPP. Because of support for all IE older versions (under 11) has ended, you do not have to create separate GPP settings for each older version of IE. WINDOWS SERVER ESSENTIALS 2012 R2. BE VERY CAREFUL AND DO NOT FORGET TO PRESS “F5” TO SAVE THE CHANGES. Add the websites and make sure your CURSOR is still blinking in the box where you added the website address. And then press “F5”. The red line changes to blue and then hit save and in Command prompt , RUN the command GPUPDATE /FORCE. Thanks a million to the author. Really good resource. However, after applying this GPO, the user still has the ability to go in and remove the proxy settings. I don’t see an option to force the proxy settings and not allow the user to remove them. And taking away admin rights to the local machine for the user is not an option. I created this policy and it is not being applied. Does anyone have this working on Windows 7 Clients with IE 11 ?? Can you check that the policy apply to the new operating systems: Windows 2012, Windows 8.1? I cannot edit the settings on the Security tab and in Trusted Sites. Its grayed out. 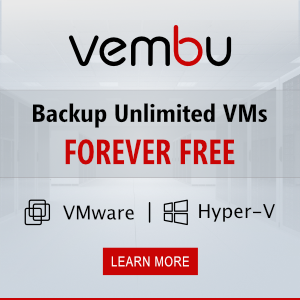 How would I add a site to the Trusted Sites? I cannot disable with F7 and F8 Languages. If I delete or add some language it will be deleted/added on user side. If I delete all languages from the list then they will be deleted also from user side. Do you know how can I disable any changes in languages? I’ve never configured languages preferences in IE using a GPO. Have you tried clicking on the Suffix field and pressing the F8 button? As I see all the available options have changed the underscore to red.